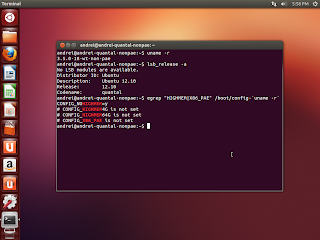 Ubuntu 12.10 and 12.04 use the PAE Linux Kernel by default for 32bit ISOs and while you could use the mini ISO to install Ubuntu 12.04 on computers that don't support PAE, that's not possible in Ubuntu 12.10. Further more, with 12.10, Xubuntu and Lubuntu no longer come with a non-PAE Linux Kernel, so by default, you can't install any Ubuntu 12.10 flavour on computers using CPUs that lack PAE support (such as Intel Pentium M). Below you'll find instructions on how to install Ubuntu 12.10 Quantal Quetzal on computers that don't support PAE. The instructions have been tested on the default Ubuntu 12.10 ISO (with Unity), but they should work with any Ubuntu flavour like Lubuntu, Kubuntu, Xubuntu and so on and probably Linux Mint 14 as well. Using the resulting bootable Ubuntu 12.10 USB stick, it should also be possible to upgrade from Ubuntu 12.04 to 12.10, but I've only tested it on a clean installation. Physical Address Extension (PAE) is a feature to allow (32-bit) x86 processors to access a physical address space (including random access memory and memory mapped devices) larger than 4 gigabytes. 1. 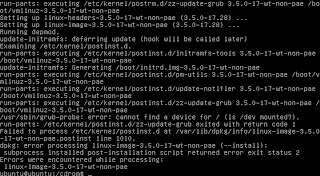 Download the required files (includes non-PAE Linux Kernel 3.5.0 deb files). Or, you can download each file manually from HERE (click the green download image on the right). rename the downloaded "vmlinuz-3.5.0-17-wt-non-pae_3.5.0-17.28_i386" file to "vmlinuz" and copy it to the USB stick, under the "casper" folder, replacing the already existing "vmlinuz" file. Note that these are the 3.5.0-17 Linux headers and image, not 3.5.0-18! ignore these warnings and once the installation completes, reboot the system (you can press CTRL + ALT + F7 to switch back to the installation and reboot from there or type "sudo reboot"). This is the latest Linux Kernel version available in the Ubuntu 12.10 repositories (3.5.0-18 and not 3.5.0-17 which we've used under steps 3-4). 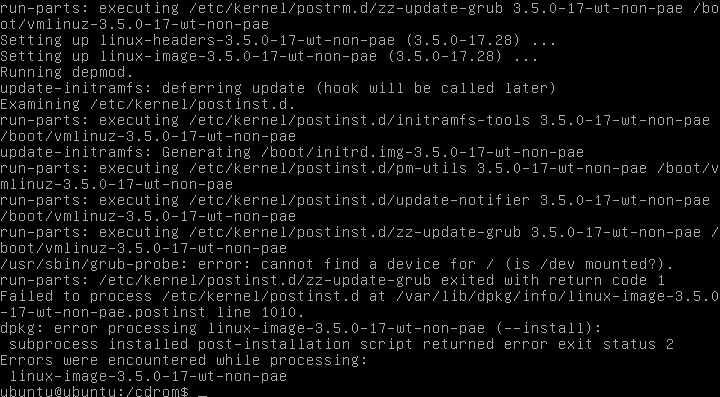 Unfortunately, there's no PPA (that I know of) to use for non-PAE Linux Kernel updates, so when a Linux Kernel update is available in Ubuntu, don't install it and instead, check if a newer Kernel has been added to the BZR repository used in this post and install it using "sudo dpkg -i *.deb". Or, compile your own kernel. Instructions adapted from HERE. 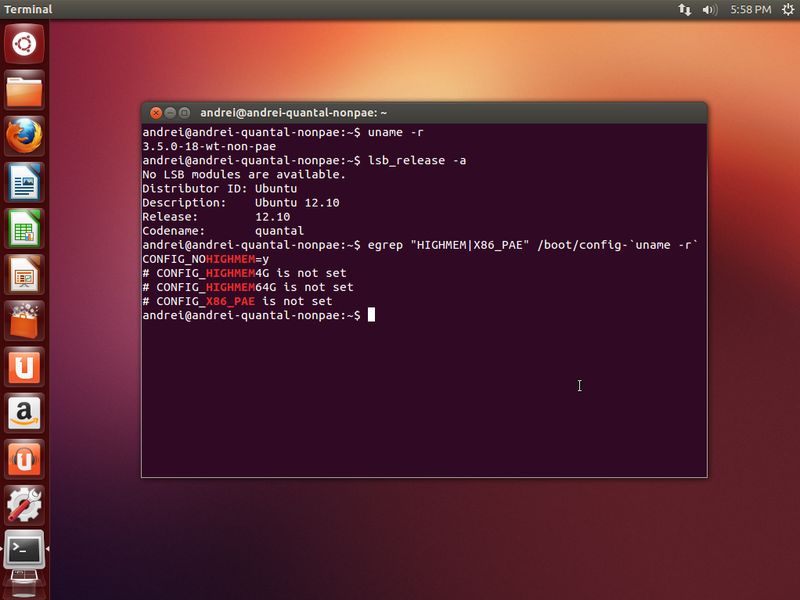 Thanks to Thomas Reith for the instructions and non-PAE Linux Kernel deb files.